This summer, Borge Ousland is going to attempt to pull off the feat of circumnavigating the Arctic Ocean by successively taking the North-East and the North-West passages. He will be sailing with a skipper aboard a light trimaran, a Corsair 31, and will be accompanied by a Russian for the NE passage and probably by a Frenchman for the NW passage. To succeed in sailing around the Arctic Ocean via the North-East and the North-West passages would be a huge challenge if Borge had not chosen to use a relatively modest yacht, a Corsair 31 trimaran. The lightness and the manoeuvrability of this multihull craft will enable the sailors to thread their way between the icebergs, to sail where other heavier and more keeled yachts (Corsair 31 has a draught of only 40 cm) couldn't go, and to draw the boat on to ground when the need arises. The trimaran was delivered to Ousland in August 2009. Since then, the Norwegian explorer has been making endless tests in the Arctic water close or not so close to his home. To accompany him on his adventure, Borge has chosen as skipper a Norwegian, Thorleif Thorleifsson, a former Norwegian naval officer who has sailed a great deal aboard submarines. 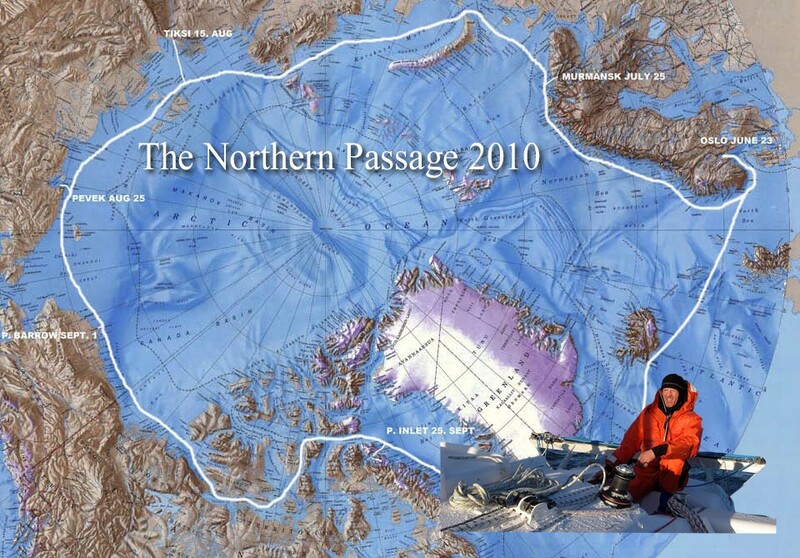 Thorleif went to collect Borge and Thomas Ulrich when they returned on foot from the North Pole in 2007. For the Russian (Siberian) part of his voyage, Borge will have another companion on board, the Russian Stanislav Kostyashin; at the time of our latest contact with him (at the end of May 2010), he was also thinking of taking a Frenchman with him for the North-West passage. In addition to the emphasis that will be placed on the indispensable rediscovery of the history of the Arctic waters via the great exploration-navigation feats of Amundsen and Nansen, the primary objective of Ousland's new adventure is to draw as much attention as possible to these particularly fragile areas of our globe and to the dangers that are threatening them - such as the opening of new sea routes or incipient offshore oil-drilling operations. Ousland rightly thinks that frequenting the Arctic water will draw more attention than an expedition on the polar icecap (the sail is of greater interest to people than the exploration itself). It's true that the men will be crossing the globe's least known seas (who indeed has even heard of the Chukchi Sea or the Laptev Sea, for example? ), which are starting to interest an increasing number of people. They will in addition be privileged to witness the rapid melting of the icecap. In order to hold as many trumps as possible, Ousland has chosen to co-operate with Google and the Discovery Channel for the media aspects of his adventure. They have done it !